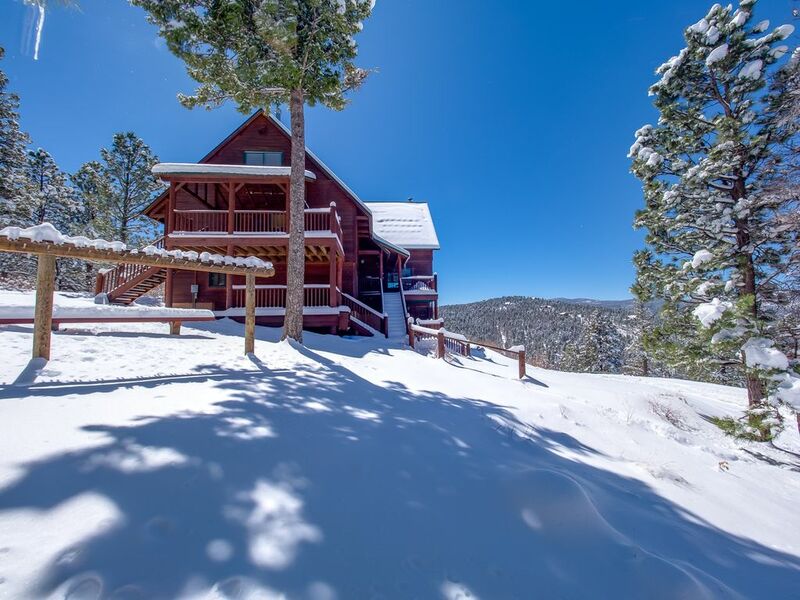 Beautiful Vacation Home in Angel Fire, New Mexico available for rent for that perfect Family Destination! This Vacation Home is available for rent all year round; nightly rental rates will depend on time of year you rent. Ski in-Ski Out Property - slopes are about 100-150 feet (about 90 steps) or so from back of house. You walk about 15 feet to a bench and ski storage area located on the property, sit down put your skis on and then ski right onto the 'Heading Home' ski run which is a little uphill. Heading Home is on 'Green' slopes; once on heading home you will ski about 3/4 mile down to lifts. Heading Home is about 3 miles long from the top to base. Home overlooks the Village of Angel Fire and is divided into five sections (8 bedrooms/8 bathrooms). This home has all utensils/amenities, Cable TV, Washer & Dryer and awesome views of the Village and Mount Wheeler. This home is a ski in-ski out property. Section A (sleeps 5) has two bedrooms; Bedroom 1 has two twin beds, Bedroom 2 has two twin beds, a living area with one futon, TV with cable, a kitchenette (sink/microwave/mini fridge) and one full bath. This section does not have a washer/dryer. Section B (sleeps 9-13 ) has three bedrooms; Bedroom 1 has one twin bed and one bunk bed (double on bottom and twin on top) with full bath, Bedroom 2 has bedroom with queen bed with full bath; Bedroom 3 has large bedroom with king bed and futon with full bath; large leather non-sleeper sectional (could sleep 2 though), 47" TV in living Room, Kitchen, Bar Area, Large Picture Window with view of Valley and laundry room with washer/dryer. Section C (sleeps 5) has 3 futons and 2 ottomans that open to twin beds, a kitchenette with small under counter refrigerator and full bath. This section also has a projection TV with large screen. Please note: in order to use the media equipment an adult will need to see the Property Manager for key. Only adults are allowed access to the equipment and only adults can operate the equipment. Section D (sleeps 9-12) has three bedrooms, Bedroom 1 has king bed with one full bath w/shower attached to room; Bedroom 2 has Queen bed; Bedroom 3 has a King bed (full bathroom with tub and washer/dryer across the hall) section also includes loft area with futon mattress, full size kitchen, dining table, washer/dryer, storage area. Section E (Sleeps 6) has one bedroom with six twin beds and one full bath. Please Note that this section does not have a separate entrance from the outside; you enter Section E from Section D or Section C.
Important Note: Mountain roads can be curvy and steep and the gravel drive is well maintained; however a four wheel drive vehicle is required during winter months. If you need something smaller, please see our other VRBO Listing No. 289287 for rental of Section B that sleeps 9-13 or contact me reference availability of Section D, C, or E.
Angel Fire is a small mountain town with amenities galore located at the southern end of the beautiful Moreno Valley, New Mexico's premier family ski resort. With 70 trails, 50% snowmaking coverage, and the only two high speed quad lifts in New Mexico. Children's Ski School, Snowboard Terrain Park, and groomed Nordic trails at the summit grace this beautiful ski resort directly across the valley from Mount Wheeler, New Mexico's highest peak (13,161'). Winter Activities: Skiing, Snowboarding, Snowmobiling, Tubing, Nordic skiing, Ice skating, Sleigh rides, Snow blades, Snow skates, Ice fishing, Horseback riding, Torchlight parades. Summer Activities: Golfing, Fishing, Hiking, Mountain Biking, Horseback Riding, Four Wheeling, White Water Rafting all at your finger tips in the summer time. Day Trips: Nearby day trips to Taos, Santa Fe, Red River, Ojo Caliente, and Cimmaron are fun for all. Guest must purchase own wood; owner does not supply wood. We had a great stay again this year. My only complaint was that the bottom level floor’s toilet wasn’t working so a family of 6 had to come to another family’s restroom each time. Wish they could have repaired that while we were there. Other than that, we love this house. We will continue to rent it for our 6 family’s each year! Glad to hear you and your group had a great trip again. I am so sorry that we could not get a plumber out over the weekend to check out the toilet, House Manager called four plumbers. The toilet is now repaired but I know that does not help you out now that you have left. I look forward to working with you again next year. We stay at this house every year. We love being able to ski in and ski out. The way the sections are split up you can bring a small group or large. We have done both. We have never been disappointed! We will be back next year. Thanks so much for your response. I look forward to working with you again next year; you are a pleasure to work with. Wonderful view and access to ski run. We really enjoyed our stay. We love skiing in Angel Fire (when there is enough snow). The cabin has an amazing view and is very nice and roomy. The driveway is a little scary and a 4WD vehicle is a necessity if there is snow. Some of the beds are very noisy making it easy to wake your spouse when nature calls. The front doorknob was defective making it VERY difficult to go in and out. Lastly, the internet service is almost unbearable. I understand a lot of people will not care about this as they are trying to get away from work but for some of us, we cannot completely disconnect from it and the internet was so slow it made it almost unusable. Overall though, we enjoyed our stay. I am glad to hear you enjoyed your stay and those amazing views. I am sorry to hear you had trouble with the door knob; it has been replaced. I totally understand some people cannot disconnect and need the internet and that is the reason we have the fastest internet service offered for the area but phone and cell phone outages off and on in the area could have caused slower connections during your stay. Look forward to having back at your home in the near future. Fabulous and so very comfortable. The Lodge was absolutely wonderful. There were indescribable panorama views from every room. Beautifully colored Hummingbirds were so close you could almost touch them. The many bathrooms were private, clean and very accommodating and the bedrooms were very spacious with great storage. Thank you so much for a wonderful, wonderful vacation! So glad you had a wonderful vacation and we agree the views are beautiful. Thanks for booking our cabin and hope you visit again soon. Ours was a Class Trip of rising Juniors and their dads. We spent an awesome week fly-fishing, white-water rafting, visiting Santa Fe, and perhaps the climax of the week being our climb of Wheeler Peak. Great outdoor fun and an amazing mountain home to serve as our home base. Although there's a splendid media room, we spent the evenings playing games and having a blast. Since this location provided an opportunity for our group to come together and really enjoy each other's company, we will always remember it as a miraculous place. The boys will treasure their time here, for sure. Thank you so much! Glad to hear that your class trip was a success and you were all able to enjoy the home and all the outdoor activities and beauty that surrounds the area; especially the climb of Wheeler Peak. Hope you and your group are able to visit soon. This is the fourth year we have rented this house. It is great for large groups and the ski-in ski-out aspect is wonderful. The house has everything you need and the management is great to work with. We had a great ski vacation for 26 people and plenty of room to spread out. You absolutely must have a 4WD to get to the house in the winter. DO NOT try it in a 2WD.